When Cat Winter's writes, the world rewinds into the past like a tape recorder, churning out stories from days gone by. But this time, the recording holds sights, sounds and smells in its grasp, and out surroundings re-form into the scene we are reading so exactly, so perfectly, we can almost see the stage; we are almost hypnotised alongside everyone else. Because Cat Winter's pen spills mesmerising words from the nib and all we can do is read and drink in the tangle of secrets, suffragettes and spell-binding scenes that make up THE CURE FOR DREAMING. This book was my first novel written by this author, but it definitely won't be my last. Cat Winter's combines historical fiction and fantasy with such deftness that the edges blur seamlessly and truly, if her books are not on your wishlist already then I think you should be doing that now. Photographs always bring a book to life, they provide kindling for the reader's imagination and we feed off them in the process of creating a novel's world in our head. So you can imagine my delight upon seeing photographs accompanied by quotes scattered amongst the pages: it just made me love the book even more. 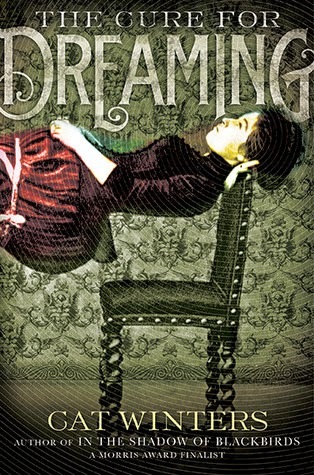 'Dracula' is made reference to many a time throughout the course of this novel, and if anything was an honest ambassador for THE CURE FOR DREAMING it would be a vampire, dressed in bicycle bloomers, campaigning for women's rights under hypnosis. So if that sounds like your cup of tea, dive right in; you won't be disappointed. I actually love the way you write your reviews- this seems like such an amazing book, and it's got a really interesting sounding plot!